Downloaded the 1.1 update; all went well and installed without any problems. Initial run provided an interesting dialog box telling me my 30 day trial had expired and offering me an opportunity to purchase it or to say I already owned it. At that point in time the blue header bar said 0 Days Left in Trial. Clicking the "Already Own" button resolved both issues and everything ran according to Hoyle. 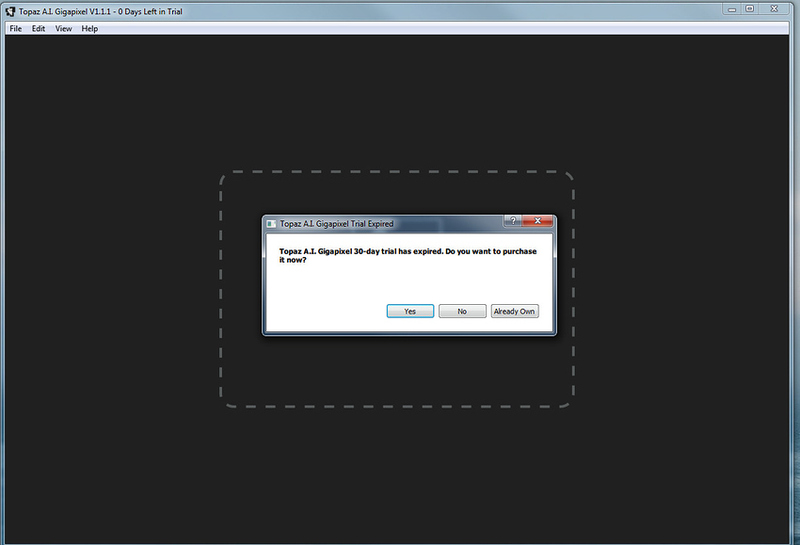 Dialog box below. Playing with the program I took a RAW image and first converted to jpg file size 2604 KB. I then took a 7% section of that file - 187 KB - and brought it into GigaPixel enlarging it to file size 5526 KB, roughly a file size 30x bigger. The result was amazing with the GigaPixel output surpassing the input. I've put all three images side by side - original shot, 7% section, and gigapixel output - in the frame below but due to its size I doubt that the results will be noticeable. You'll just have to take my word for it. The program is really working well!